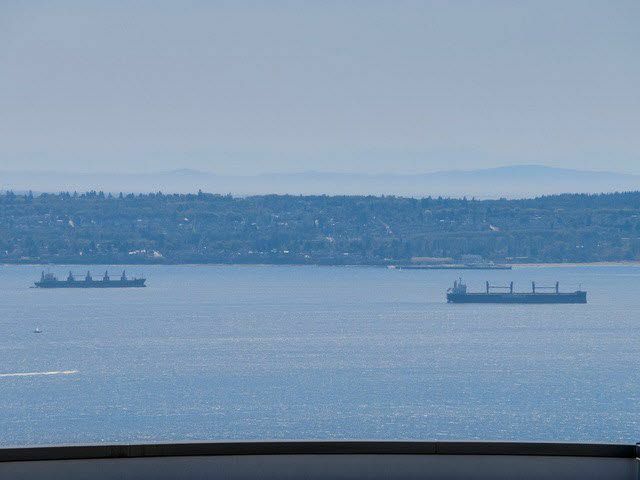 This spacious end unit boasts spectacular city and ocean views. This two level apartment offers main floor living with 2 bedrooms up, large kitchen and open concept dining and living room that enters onto your gorgeous wrap-around patio to soak in the sun from sunrise to sunset. A good size rec room, 3rd bedroom and laundry room on the bottom floor are perfect for a young family or downsizer. Feels like a house as there are two separate entrances with one only 2 steps up from the driveway....perfect for bringing in groceries. The end unit gives you full privacy, is extremely quiet and you look over beautiful gardens to the ocean. New paint, carpet and engineered hardwood. 2 parking stalls. Open House Sept. 6th 2-4 p.m.